Louis Souza was fishing near Hana, Maui with his gang when he took a strike on his 14-foot Sabre pole. He battled the giant ulua using a 6/0 Penn reel packed with 100-lb test Ande line until the fish was exhausted. 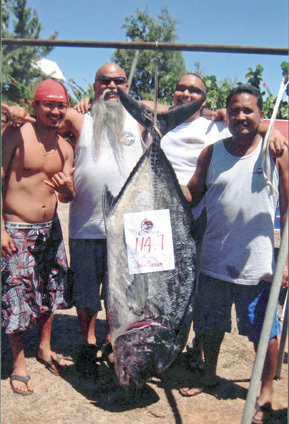 The 114.7-lb ulua was a fish of a lifetime.